Have you ever made chicken quesadillas? Chances are you probably have; they’re a fun, easy recipe to prepare for yourself. However, if you’re planning on serving quesadillas for your upcoming New Year’s Eve celebrations, preparing one after another can quickly become a hugely time consuming task. Making a big batch of chicken quesadillas doesn’t need to be a difficult process, however. All you really need to do is grab a sheet pan and flip your oven’s “on” switch. The first thing you’ll need to do is to make sure you let the filling cool sufficiently. Remember that it will take longer to make the crispy surface in the oven than if you were using a frying pan. 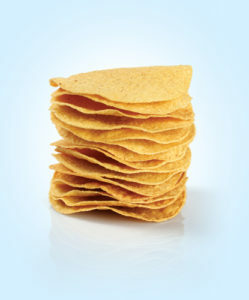 Should you use hot filling, the steam within the quesadilla may become too soggy, preventing it from becoming crispy. The next step is to spray whatever tray you’re using with oil and then throw it in the oven so it heats up, this will help significantly with making sure that the underside of the quesadilla becomes crispy once you’ve flipped it. Make sure to increase the heat in the oven a few notches, but don’t overdo it or else you risk the edges of the quesadilla becoming a little too brown. 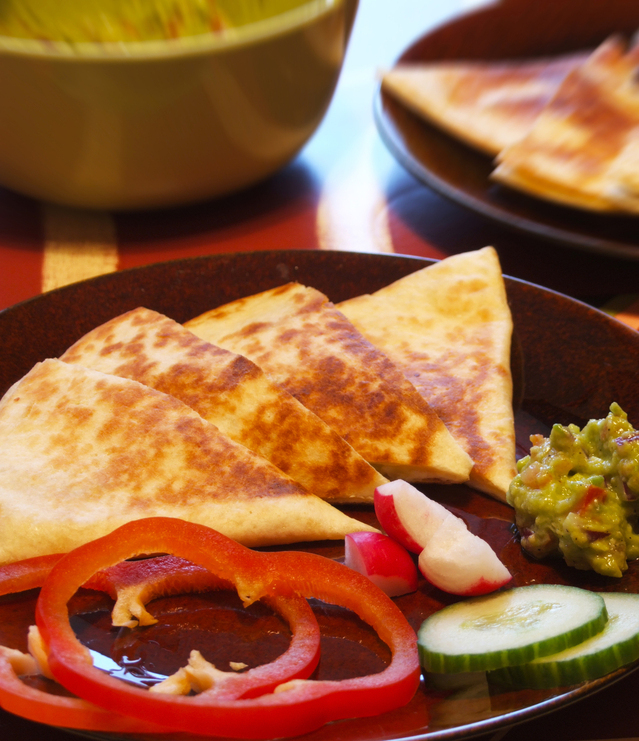 Using these tips, you should be able to make an entire sheet of any quesadilla you like. Simply cook the filling without the cheese and let it cool. Spray a baking tray with cooking spray, preheat it to 430 degrees in the oven while the cooled filling and shredded cheese is being distributed between each tortilla. Fold the tortillas, put them on the hot baking tray, and let them cook for about eight minutes. Flip the tortillas over, place them back in the oven for an additional eight minutes and keep an eye on them once they’re crispy all over. Grab a large skillet, place the bacon inside and cook it over medium heat until it’s crispy. Place the bacon on a paper-lined paper towel and then wipe down the pan with another paper towel. 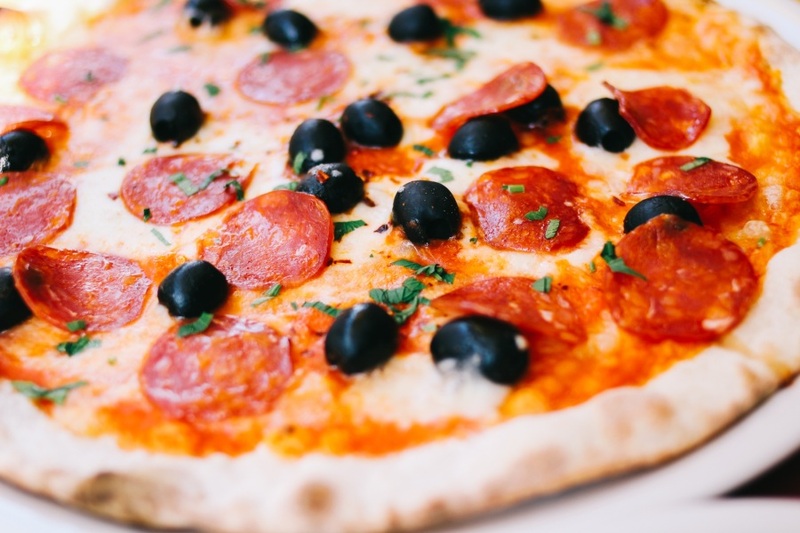 Place the amount of pizza sauce you would like on one of the tortillas, making sure to spread the sauce around evenly using a spatula. Place some mozzarella on top, add the bacon, a drizzle of the garlic powder, and the oregano. You can also throw in the red pepper flakes if you like. Heat about a teaspoon of butter over medium heat and use it to coat the pan you’re using before adding the tortilla to the pan with the topping side up. Cook it for about 30 seconds to a minute until the cheese begins to melt and the tortilla becomes puffy. Using the spatula, fold the tortilla in half and then resume cooking, making sure to flip both sides over until they are both brown. Remove the tortilla and then slice it into four pieces. Repeat all steps for the remaining tortillas. Keep in mind you can also add any other toppings you like, including vegetables. Begin by mixing the cinnamon, cardamom, maple syrup, and vanilla extract. Apply the mix liberally to both sides of each tortilla. Using one side of the tortilla, sprinkle whatever nuts you chose, followed by a drizzle of the melted chocolate on top of the nuts. 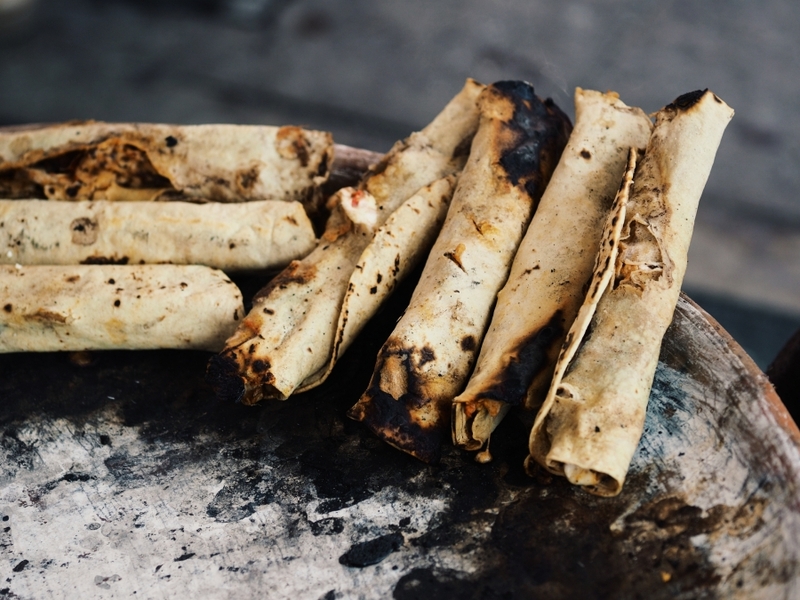 Roll up the tortillas and allow them to sit, covered, for a minimum of twenty minutes. Preheat your oven to 400 degrees Fahrenheit and bake for ten minutes. To make the glaze, mix all of the glaze ingredients with the melted butter until the mixture is uniform. Once it’s ready, drizzle it over the tortillas prior to serving. To prepare the sauce, melt the butter in a skillet over medium heat and follow by whisking in flour and salt. Cook for about one minute and then whisk in the chicken broth, slowly. Continue with the stirring until everything has thickened and then whisk in the sour cream. Heat it up but do not let it boil. Add the jalapeños, remove from the heat, and place everything aside. The next step is preparing the tortillas. Using a skillet that’s slightly larger in diameter than the tortillas, pour the oil until it’s about a half inch deep and then heat it up over medium heat. Dip both sides of the tortillas in the hot oil for a few seconds until it’s softened and then drain flat on a paper tower. Make sure to repeat the process for all of the tortillas you’ll be using. Spread a ¼ cup of the sauce on a shallow baking dish so that the enchiladas don’t stick. 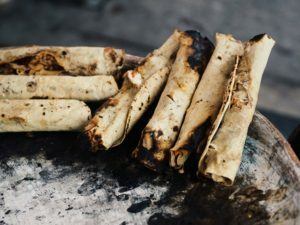 Put some chicken, cheese, and onion in the tortilla and then roll it up with the seam side down in the pan, repeating the process for the other tortillas. Pour whatever sauce is left over the enchiladas and then follow with a sprinkling of cheese on top of each one. Preheat your oven to 350 degrees, bake them for twenty minutes, and you’re ready to serve.